The texture reminds me of the filling you’d find in an almond croissant: moist and gently marzipanny. Belinda enjoys this cake as is for afternoon tea but she says it’s also easy to dress up with poached fruit and rich cream to turn it into a very elegant dessert. Thanks Belinda for kindly allowing me to share a Thermomix version of your cake. I use raw sugar, rather than caster, and a little less of it. I also use natural almonds, rather than almond meal. Here’s Belinda’s recipe. See below for my interview with Belinda. 1. Preheat oven to 180°C (350°F). Grease and line a 22 to 24 cm (9-10 in.) springform cake tin. 2. Place butter in mixing bowl and melt 6 min/50°C (120°F)/speed 1. Set aside in a bowl. 3. Place almonds in mixing bowl and grind 10 sec/speed 9. 4. Add coconut, sugar and salt. Mix 10 sec/speed 5. 5. Add melted butter, eggs, vanilla and almond essence. Mix 40 sec/speed 5. 6. Turn mixture into tin, scatter with flaked almonds and bake for 40 minutes (180°C / 350°F), or until the top of the cake springs back slowly when you press it gently. 7. Cool the cake in the tin on a wire rack, before carefully removing from the tin. Dust with icing sugar, if desired. 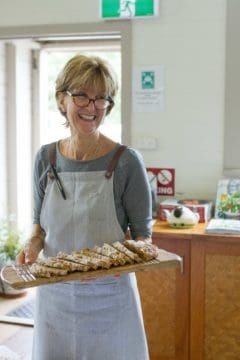 Now best known for her cooking classes, Belinda Jeffery is also a multi-award-winning cookbook author who has worked as a restaurant chef and, in the 1990s was a popular presenter on the TV show Better Homes and Gardens. She’s been living in the northern New South Wales community of Mullumbimby since 2002. Belinda is all about great ingredients used in easy, wholesome dishes to share with family and friends. I think you can almost hear the chatter and the ‘ooh’s and ‘aah’s when you read her recipes! 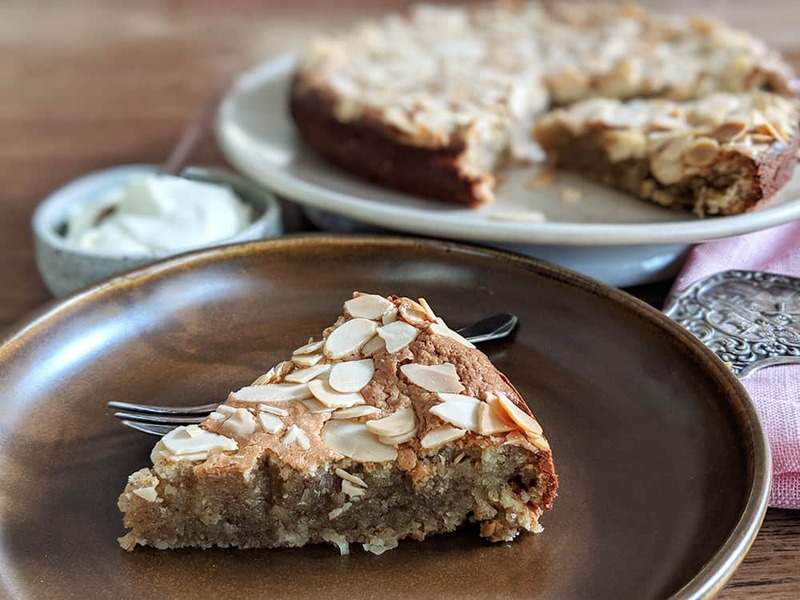 To celebrate my publication of the Thermomix version of her brilliant Flourless Almond, Coconut and Vanilla Cake, I caught up with Belinda for a chat about baking. Tell me about your history as a baker. It’s a constant, it’s always been a constant, ever since I was a little girl. Baking was the first cooking I did and when my mother got the Margaret Fulton cookbook I’d get that down and pore over it. I became the family baker for all the birthday celebrations. What do you think it is about baking that so appeals to children? Well, cakes taste delicious. I think most kids get more excited about the end result if it’s something they really want to eat. It’s tactile too: if you start with scones, kids can get involved with rubbing the butter into the flour, shaping the dough, cutting out the scones. It’s a bit like playing with Playdough. There’s also the transformation: you start with eggs, flour, sugar, butter and those ingredients end up being a beautiful cake. It’s satisfying and a wonderful place to get children started. What do you find so satisfying about baking? As a restaurant chef, I was always most happy in the pastry section. Maybe it’s just because it’s far more appealing to deal with making six cakes than to clean six octopus! I love working with beautiful ingredients that smell wonderful – vanilla, chocolate – much nicer than an octopus! Even now, I go into another world a bit. I love focusing on it, the smells, the ingredients. Really good butter, great eggs, good vanilla, what can be more perfect? I’m not a fancy baker, though, it’s all homestyle, a simple cake or pastry that you can throw some fruit it, a dusting of icing sugar, and I find that those simple cakes are the ones that people go crazy for. They’re not just satisfying on a physical level, they’re also soul-satisfying as well. What about this amazing almond cake? More than any recipe I’ve ever done, this is the one that people fall for. It’s such a great flavour, it’s very buttery, incredibly moist, and it works for people who are gluten-intolerant or coeliac too. I often serve it to people for morning tea at the start of m cooking classes. They enjoy it so much and it’s just a lovely way to start our time together. See more about Belinda on her website.